From the moment you notice a scorpion in your area, your mind likely moves directly to how to get rid of scorpions in and around your home. These pests are not only annoying, but some species are potentially dangerous. If you have children or pets in your home the issue needs to be addressed immediately. Below you will find helpful information on how to get rid of scorpions and other bits that may be important in the removal process. A scorpion is an arachnid. They are kin to mites, spiders, and ticks. You will not mistake them for their cousins though because scorpions have very distinguishable characteristics. The body of a scorpion slims down towards the tail. There are five segments in the tail, which arches over the body. At the very end of their tail scorpions have a bulb of poison. Because they have four pairs of legs, the scorpions can travel quite quickly. There are two eyes on the very top of a scorpion’s head and several more along the side of it. You may think this allows them to have a great sense of sight, but it doesn’t. Their sense of hearing is what they rely on most and then feeling around with their pincers follows behind. Because scorpions are nocturnal, they hide during the day. The life span of scorpions varies drastically. Depending on the species, maturity is often not reached until around six years. On average their life span is three to five years, though some have lived to between 10 and 15 years. As far as mating, the male scorpion has to invite the female with a mating dance. Depending on the type of scorpion, the dance could last from a few minutes to several hours. Once she has accepted his offer, he will move her over the sperm packet he dropped, which will be inserted into a pouch in her abdomen to later fertilize her eggs. Gestation is anywhere from a few months up to a year and a half. A female can have up to 35 babies. Scorpions are born live and travel on their mother’s back until they molt the first time. They generally don’t reach full maturity until they have molted five or six times. Before addressing how to get rid of scorpions, you will need to ensure their food sources are handled. These insects tend to eat bugs smaller than them. Sometimes they will even eat other species of scorpions if they are smaller in size. Generally their prey is on the small side but if something larger comes by, they will sting it until there is no struggle left. It may take quite some time for the scorpion to finish a meal, but they will stick around until only a carcass is left. 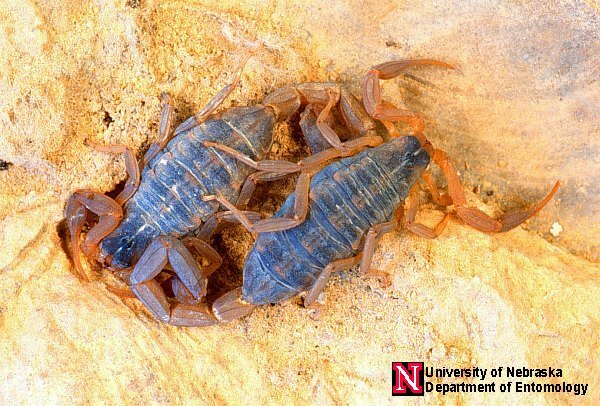 There are several different species of scorpions found in the United States. Because of that, where they are found across the country is quite diverse. These are some of the various habitats you may find scorpions living in and around. Deserts. This is probably one of the places you would imagine scorpions residing. Generally this is how they are presented in movies and shows, and many of the desert natives have encountered at least one or two in their lifetime. Sand dunes. Again, this is probably not a shock. Sand seems to be associated with scorpions. Mountain areas. Depending on the climate, this is an ideal place for scorpions to hang out. Plenty of dirt and rocks with vegetation provide ample food and shelter for the insects. Grasslands. Depending on the height of the grass in certain areas, scorpions actually can live quite comfortably. Though they generally prefer more dry conditions, the grasslands have some species that thrive there. Forests. Scorpions are incredibly prevalent in dense wooded areas, especially with dead vegetation. Some species thrive off of dead wood and other smaller insects, which makes this an ideal place to find them. Before you can decide how to get rid of scorpions, you will need to find out where the root of your problem comes from. Scorpions often hide in places you may not even think to look, which is why you should be searching your entire home top to bottom. These are a few of the spots you may find these pests in your home and outside in your yard. Attics. Because scorpions like dry and warm conditions, attics seems to be a place they hide. They are able to climb walls and siding, which makes the attic easily accessible to them. Basements. This is also likely because of accessibility. Scorpions can easily find their way into your basement through window wells and cracks or openings in the foundation. Under tree stumps or other wood piles. They enjoy dead vegetation and often feed around wood piles or dead trees. Where there is dry wood, there are likely scorpions. Yard. If you are leaving shoes or towels outside, you will need to shake them well before using them. Scorpions like to find places to hide, and in your shoe is one of their prime spots. This is especially important if you are in the southwest states. Learning how to get rid of scorpions is complicated because certain species need to be handled differently. The unique thing with scorpions is that the best way to get rid of them is to eliminate them around your home. Below are some tips for pesticides and other things you can to do get rid of the problem easily. Remove debris from your yard. Wood piles, scrap, and anything else hanging out in your yard gives scorpions several places to hide. Removing these things will eliminate their feeding spots and often force them to find other places to hang out. Clean your entire home. This will need to be done from top to bottom, leaving no surface untouched. Everything must be off the floor. From cleaning out cabinets to sweeping out the crawl space, every crack and crevice needs to be cleaned and looked at. Insecticides. Insecticidal dust is what is recommended for deterring and killing scorpions. Depending on the size of the insect, it may not work. Larger varieties of scorpions can withstand more poison than small versions. Glue traps. These will not kill the scorpions, but they will get them trapped. If you are unsure how bad the problem is, this is a good place to start. Once you catch them, you can dispose of them in whatever way you want. If you choose to release them, make sure you are far enough from your home so that the scorpion will not return. Exterminator. This will cost a pretty penny, but it is worth it for the peace of mind you will have. Many companies are backed with satisfaction guarantees so that if the problem isn’t handled the first time, they will return to fix the problem free of charge. Call around and ask for quotes. Often you will find a company will offer a better rate if you choose them over the competition. Once you learn how to get rid of scorpions, you will need to take precautions for prevention in the future. Keeping these pests outside of your home is the safest way for your children and pets to remain free of the potential danger they pose. Below are some tips for keeping scorpions out of your home and yard. Maintain a clean and debris-free yard. Scorpions need places to hid and places to feed. Since they eat insects, your yard is an ideal place. Keep your grass mowed and any clutter up and out of your yard. Spray around your home. Once you are sure all of the scorpions are out of your home, spray around the perimeter to try and keep them from entering your home. Be sure to read the instructions for how the spray will affect any children or pets you may have. Keep your home bug-free. Since scorpions feed on small insects and spiders, if these things are not in your home the scorpions will have no reason to be in there either. Use sprays and sticky traps to ensure the bug situation is under control. Seal any cracks or cervices you find around your home. During the day these pests are hiding in cracks or other openings around your home. Check around the foundation, in the siding, and any other areas you think may need to be addressed. If you are unsure about where to begin, ask a professional to come out and check. Usually an estimate is free and you will know what needs to be done. Weigh the cost options because sometimes doing it yourself isn’t always the cheapest route. While it is frightening to find a scorpion in your home or yard, it doesn’t necessarily mean you have a problem. Learning how to get rid of scorpions can be tricky, especially if they are the kind that is resistant to insecticides. Remembering to clear the clutter and remove debris is the best possible way to prevent scorpions from being attracted to your home or yard.